1. 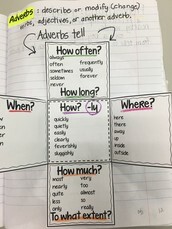 Write Adverbs on page 11 in your GRAMMAR Table of Contents. 2. Cut out the Adverbs title and glue it to the far LEFT of page 11. Click the picture to see the example. 3. Color the foldable according to the picture. 4. Cut out the foldable and glue JUST THE CENTER square down to the page in the same spot as the example. 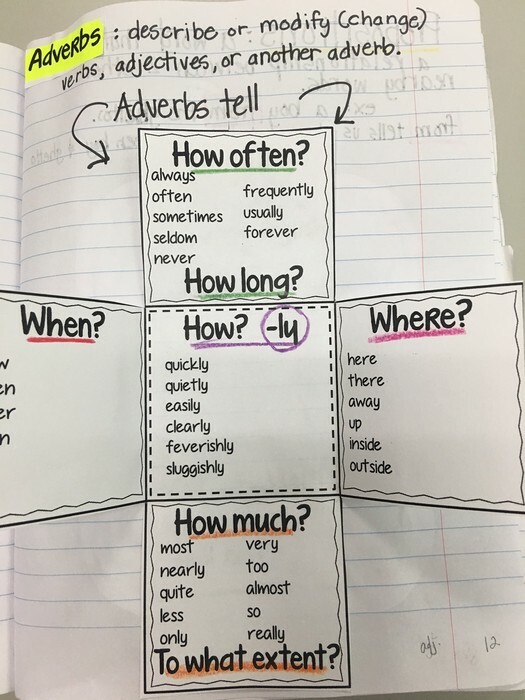 At the top of the page after the title--Define Adverbs. 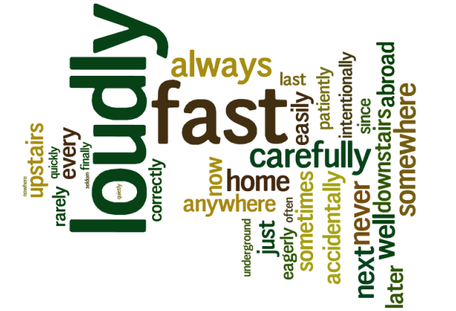 Adverbs describe or modify (change) verbs, adjectives, or another adverb. 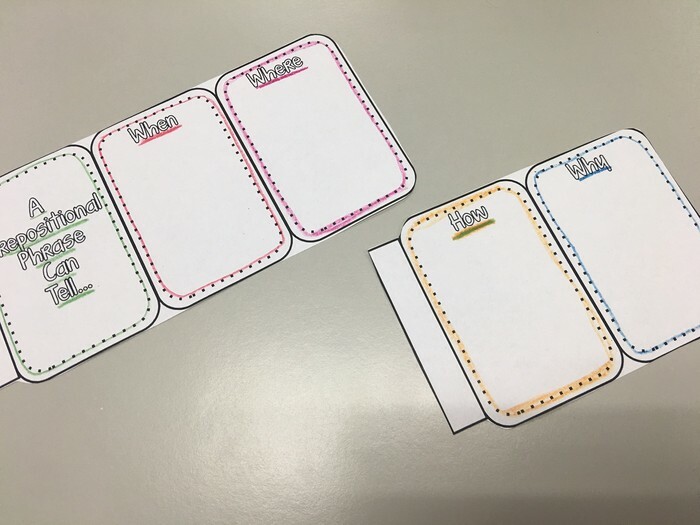 Write these sentences with BLANKS __________________ underneath each flap. How often? : She ___________________ needs to use the restroom during English. Where? : After the game I will meet you __________________ by the gym. How? : She went to the store very ____________________. How Much?/To What Extent? : Her mistake will cost _______________________. When? : I would rather you finish your work _________________. Read each sentence to yourself replacing the blank with one of the words from the box. CLICK HERE to play a game to review adjectives and learn more about adverbs. 1. 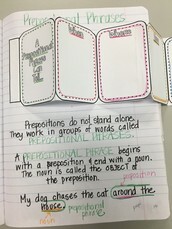 Write PREPOSITIONS on page 12 in the GRAMMAR section of your INB. 2. 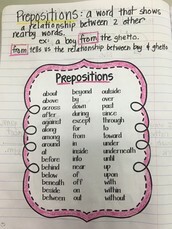 Write PREPOSITIONS on the TOP LEFT of page 12. 3. Color the chart like the example. Glue it all the way down to the page. Take notes and make them look JUST LIKE the example above. Click on the picture above to enlarge it. A word that shows a relationship between 2 other nearby words. 1. 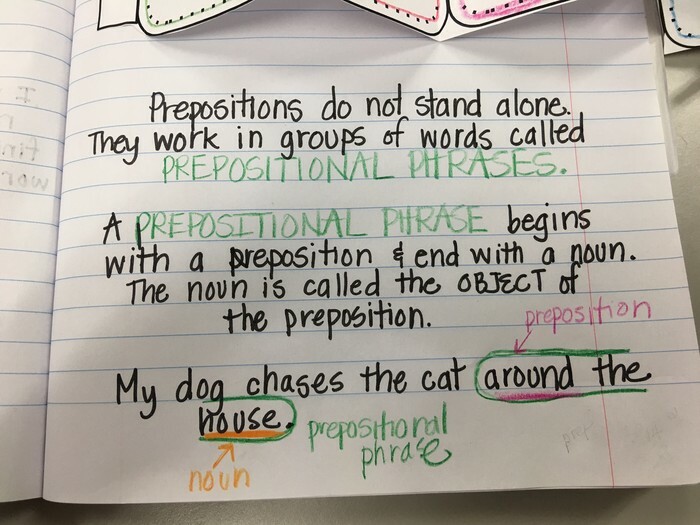 Write Prepositional Phrases on page 13 in your Grammar Table of Contents. 2. 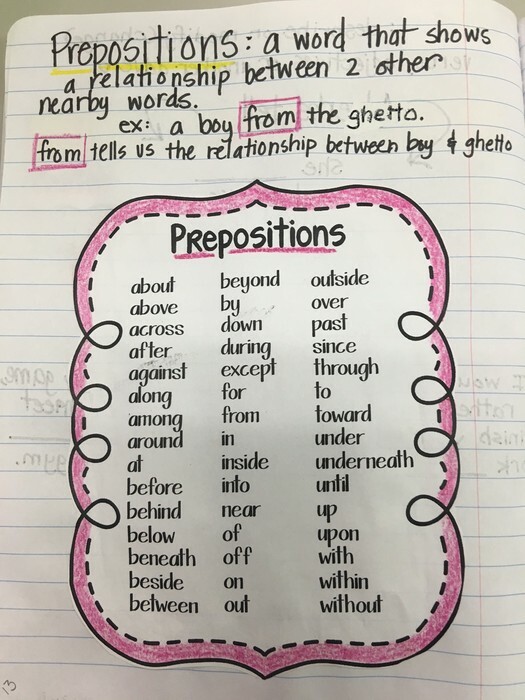 Write Prepositional Phrases at the top of page 13. 3. 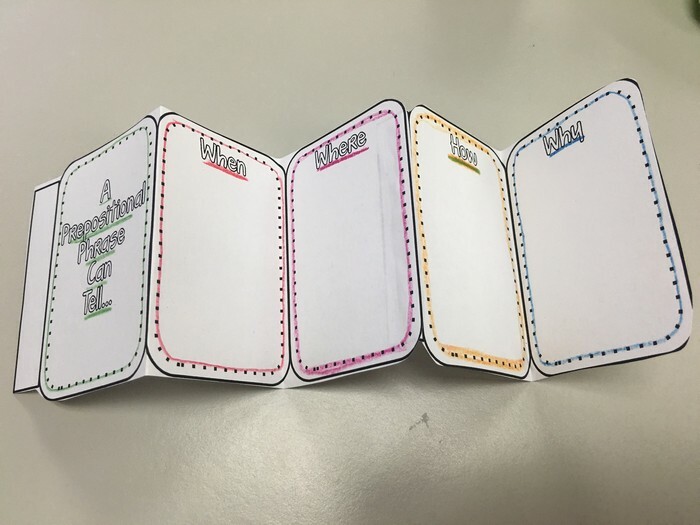 Color the foldable according to the examples pictured below. 4. Cut it out and glue it according to the pictures below. 5. You must glue it to the top of the page. You will need the bottom of the page for notes. 6. 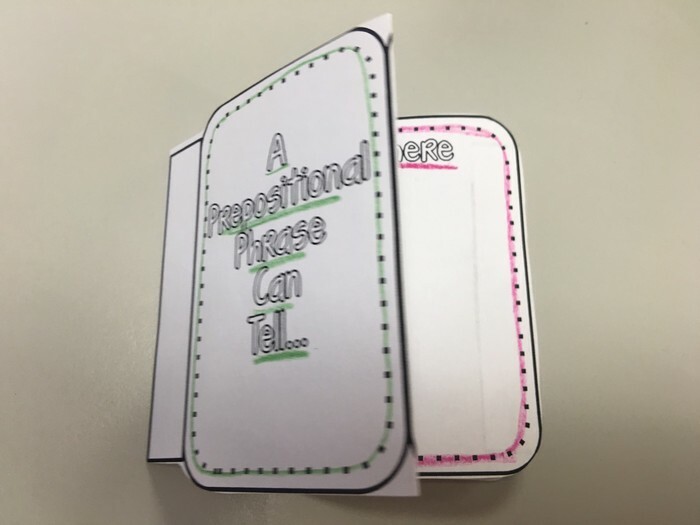 PUT THE WORDS FROM PAGE 12 INTO THE CORRECT CATEGORY ON THE FOLDABLE. Click on the picture and copy the notes onto the bottom of page 13. 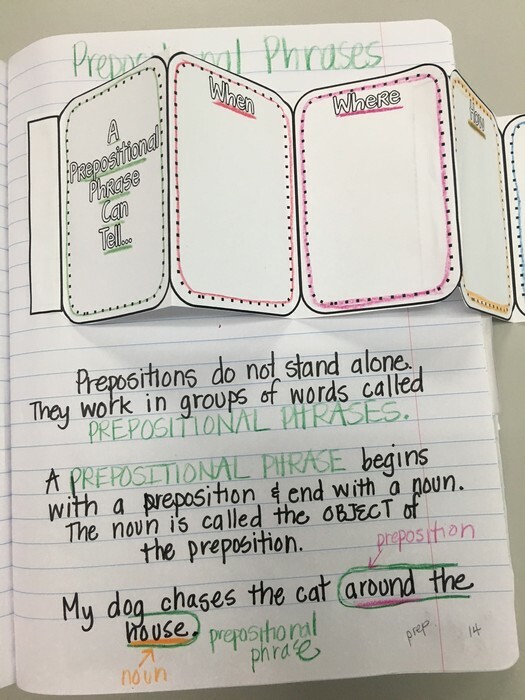 Watch the video below to learn more about prepositions. Click HERE to play a game with prepositions.